Still : Sonam Kapoor and Salman Khan Spotted flaunting and talking about PRDP. Prem Ratan Dhan Payo 9th Day Collection – PRDP witnessed another huge drop on 2nd Friday, collected only 5 crores as per early estimates. 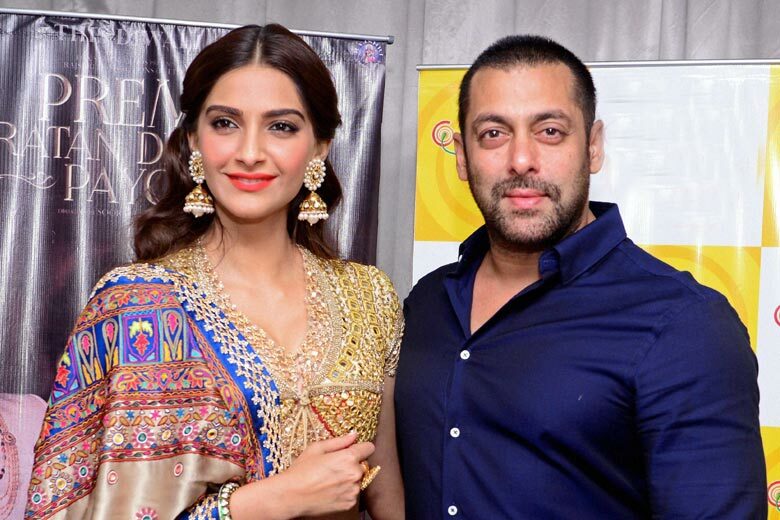 Salman Khan’s Prem Ratan Dhan Payo is now struggling at the domestic Box Office. After a decent opening week with the collection of 165.45 crores, the movie witnessed a significant drop on its 9th day. As per early estimates, the film collected only five crores on its 2nd Friday. Still if PRDP shows decent growth in 2nd weekend, then there are good chances that it will 200 crores easily. PRDP had to sustain a setback from Multiplexes and Cineplexes in large cities during this week. On the contrary, the small town fan following for Prem Ratan Dhan Payo has not gone down, helping the flick to sustain still on Box Office. With a total collection of 178.32 crores, PRDP is already the second highest grosser of 2015 behind Bajrangi Bhaijaan (321 crores). PRDP will become the 11th highest grosser of all time on its 10th day beating the lifetime collection of Bang Bang (181.3 crores). The movie has recovered its big budget of 115 crores and is declared a clean hit by Box Office India. PRDP needs to show healthy growth in its second weekend to emerge as a big hit that is currently looking a big task at hand. Considering the current performance, can you predict the lifetime collection of Prem Ratan Dhan Payo.